You are here: Home / Articles / Which V Planner am I Using? In case you need to know which V Planner you are using, I made a brief video showing where to look on your V Planner. 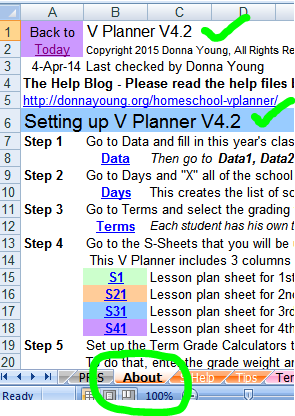 The version of the V Planner is posted on several worksheets. Pictured here is the About worksheet. The version is also posted on the Today worksheet as well as the mysterious IC worksheet. Thanks, this video and information was created by request.